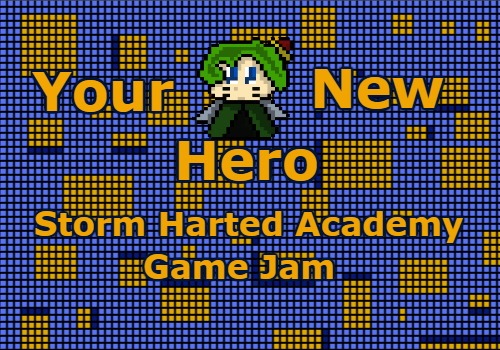 The "Your New Hero" Jam by Storm Harted Academy is a new jam where you must create a game based on the sprite image in the banner and background. UPDATE: This jam has been cancelled because no entries were made. We deeply apologize. The best game as chosen by you will be canon to any future games that have to do with the character. The winner gets no prizes accept a free, non-refundable, revocable license to make and distribute games with this character as long as you message us before making the game. If a game gets made without our approval then we WILL take action. In exchange for this license the winner of this jam agrees to allow us to make and distribute games with this character whenever we wish without prior approval from the winner. The winner of this jam is allowed to put the character in any game as long as the character is a non-playable character and has no canon place in the story. The winner can do this without our approval. Legal measures will be taken to anyone who uses the character without prior written approval from us, our ceo, or respective partners. By sending in your game for the jam, you agree to these terms. This jam is using itch.io to host entries. You'll need to register or log in on itch.io in order to submit your gamejoin this jam. After signing in you can create a new game on itch.io then return here and click the submit game button again to enter your game.